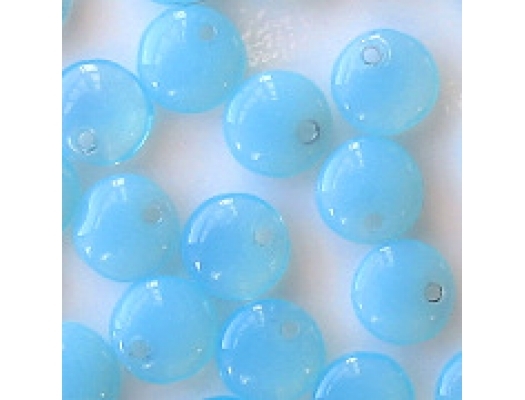 6mm wide flat, round beads (about 2mm thick) with the hole on one edge. 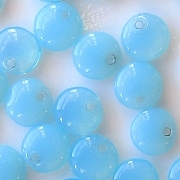 Milky or opalescent aqua; the picture doesn't show it well, but some beads are lighter than others. These beads have some problems. Many of the holes are dirty. I assume that if you soak the beads in soapy water, the dirt will come out, but I don't know. Some of the beads have a very small crack emanating out from the hole. The cracks are small and wouldn't usually be a problem, but there is dirt in some of the cracks, so they are visible. Also, a few beads may be misshapen. 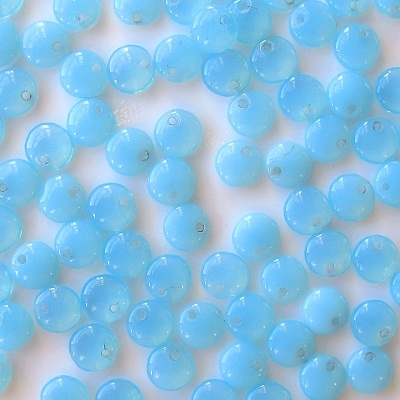 Altogether, I think that 85% to 95% of the beads will be usable; I reduced the price substantially. Before I took these beads off the strand, they looked perfect. Even with all the little problems mentioned above, I suspect the beads will look perfect once you string them up and they are surrounded by other beads. However, if you hang the beads individually from wire, you'll need to make sure the hole is clean.